When you look at the image below, you may think it is just a fuzzy ball of wool that is spun together. 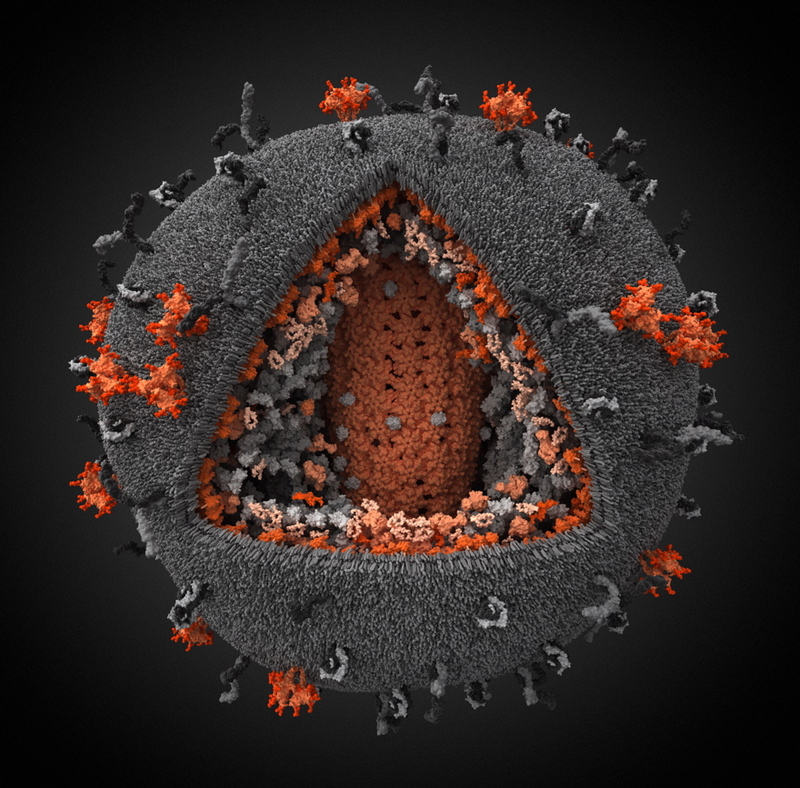 But, amazingly it is the best 3-D Simulation model of the Human Immunodeficiency Virus [HIV] which displays even the tiniest proteins from the HIV virus and the host it infects. This model has become the winner of the 2010 Science and Engineering Visualization Challenge, sponsored by Science and the National Science Foundation. This model was created by the Visual Science Company in Moscow and has helped in providing the best knowledge of the structure of HIV and its biological formation which was collected from more than 100 scientific papers. In the model you can see many colours like orange, and gray in many shapes and sizes. Orange denotes the parts of the particle encoded by the virus genome. Gray denotes the parts captured from the host cells. The orange structure that is seen to push or jut outwards denotes surface glycoprotein trimers, which allow HIV to bind and fuse with the host cell. The viral plasma membrane is mostly chosen from the host cell as newly formed viruses bud from infected cells. The orange structure that is seen at the center of the model is the capsid, a cone-shaped pod that holds the viral RNA and enzymes. It is amazing that such an accurate model can be created when we know that each HIV particle only has a diameter between 100 and 180 nanometers. Its genome consists of just nine genes encoding 15 different proteins. Today, the total number of people supposed to be carrying this virus is almost 35 million people. Let us hope that such a discovery will help the researchers to find an anti-virus for this dreadful disease. The original images have not yet been published. They will be published in the next issue of Science magazine that is to be released on February 18th.